1 To make the ginger sugar rim, first rub a quarter of lemon around the rim of your glass. Mix the sugar and ginger together on a plate, and dip the glass into the mixture to coat the rim. Fill the glass with ice. 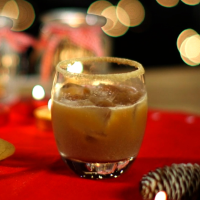 2 Measure the rum, ginger liqueur and Kahlúa into a cocktail shaker, and stir in the chai latte powder. Fill the shaker three-quarters full with ice, then shake well. 3 Strain the cocktail into the glass.